DISCLAIMER: This blog states only the opinions of a Peace Corps volunteer and in no way states the opinions of the Peace Corps Organization or the US gov. I hesitated for a while trying to decide whether or not I wanted to write one last entry. Summing up two years cannot be done. Even trying to pin down everything I’m feeling at the moment seems impossbile. Currently travelling through Europe with a couple of friends which certainly makes all of this easier. Saying goodbye to Mali was much harder than I thought it would be. When I think back on some of my hardest times in Mali, there really aren’t that many over a period of just over two years. The first few months of training weren’t all that difficult, but they certainly did crawl. My first difficult time was definitely when I got my boil. I had no idea what it was, and the idea of going to a village doctor talking to me in Bambara was absolutely terrrifying. I was in a lot of pain for several days, and had a lot of trouble sleeping. I felt pretty helpless being at least two days away from Peace Corps doctors in Bamako. The first extended difficult period I had was my first hot season as temperatures broke 120 degrees. Even harder was actually coming back from a vacation to the states. I remember that first week back, just spending tons of time in Bamako and Kayes watching TV shows, going on the computer to see everything I was missing, and really, really not wanting to go back to site. My single hardest day was recovering from schisto, a parasite I had. The medication just absolutely knocked me out. I can’t remember ever feeling that wiped. I had another little slump in August a few months either way from a vacation, and my last hot season wasn’t much easier than the first with my blister beatles on my face and arm. But, by far my hardest time in Mali was my last couple weeks or so as I attempted to somehow say all my goodbyes. A lot of people I knew had already left me in the dust by the time I was saying my farewells. I saw a couple people who preferred to leave in the middle of the night rather than deal with goodbyes. Some others told people well ahead of time, and then had to deal with all the requests for help with visas, all the people who wanted our stuff, etc. Some of my friends were able to take this strategy and handle it all with incredible grace. I’m really not the type of person who needs or wants a big goodbye. I decided to tell people in Dialafara a couple days before I left. I was able to spend my last couple weeks just relaxing, and trying to soak everything in. I had some really good conversations with Tiokon, my homologue, the last couple of days. We did a lot of reminiscing, and I made sure to let him know how much he has meant to me, and how thankful I am for everything he and his family have done for me over these two years. I went around town and said goodbyes and gave small gifts to the Berthes and Sows, two families who have been nothing but kind to me and never asked anything at all of me in return. My host family allowed me to take pictures. We exchanged contacts, and the last day they wanted everything I owned. I had so many requests for everything from buckets and bikes to mosquito nets and beds. It made me happy I only gave them two days notice. For the most part, every goodbye was a good one. Malians are quick to give blessings and many people gave me kind words before I left. Another practice a couple of them liked to do is to shake hands with the left hand. In Malian culture the left hand is viewed as the “dirty” hand. So a left-handed handshaked is just wrong culturally. Saying goodbye in this way means that you must in the future come back to rectify the error committed in this way. I personally only felt comfortable saying goodbye the American way with a couple of Malians, but I gave out a couple bear hugs and told them that was how we say goodbye. One last cultural exchange. For some reason, I breathed a false sigh of relief when all my Malian goodbyes were over. I still had some really hard goodbyes. My friends in Kayes saw me off with a really nice party complete with champagne. We had one more party at the newest group’s swear-in. And finally it was time for a lot of important goodbyes. We’re a pretty tight-knit group. Partly by neccesssity, since we’re so isolated. Saying bye to all the Peace Corps staff was another thing I didn’t really think about. But, all of those goodbyes were incredibly and overwhelmingly nice. Tons more blessings continued. Despite being really, really far from Bamako, I always felt completely supported by the entire staff. They were all always one phone call away. Between all the goodbyes, and otherwise doing pretty much nothing in Bamako it was a really terrible week. I had a ton of paperwork to do in order to officially close my service, but other than that I had nothing to do but wallow in my sadness. I took a ton of naps. It’s funny really, I spent the entire time counting how many days I’d spent in Mali (it was 770 days), and how many I had left (zero). When I started to get close though, more and more I didn’t want it to end. It was certainly a strange mixture of feelings as my time wound to a close. I don’t think I’ve ever had a more depressing car ride than the final car ride to the airport. The three of us clearly thinking about everything we’d just left behind. My two friends and I were completely silent for essentially the entire trip. There were really just no words at all that could do the situation justice. Landing in Marseille greeted by my aunt and uncle certainly helped things. Each of us ate our weight in cheese and seafood, and drank amazing french wine. Certainly a change from our rice and sauce; and filtered water for that matter. Budapest was a really pleasant surprise, and Prague is one of the most beautiful places I have ever been. Tourists seem to be quickly discovering that fact, and the city is flooded with English and Australian tourists especially. It’s really weird seeing all these white people around town, and being able to walk around without every single eye on you. I’m eating really well, seeing all these beautiful cities, and just trying to take in as much of it as possible. Still, I’m really looking forward to the day I touch down in Newark. Seeing all of my family and friends is definitely something I’ve looked forward to for a very long time. It´s hard to believe it´s been two years already. Doesn´t feel like anywhere near that. It has been really strange being in this weird in between place that is neither Mali nor New Jersey. I´ve had an unbelievable time in Mali. Absolutely incredible the number of adventures and memories I´ve taken away from this place. Every trip on public transport in old rickety cars on dirt or even mud roads turned into an epic journey. Parasites, blood blisters, boils, and countless stomach issues. I loved every second of it. The best thing about life, at least for me, is all the ups and downs. Not being afraid to experience everything, both the good and the bad. That´s what makes this crazy life so much fun. 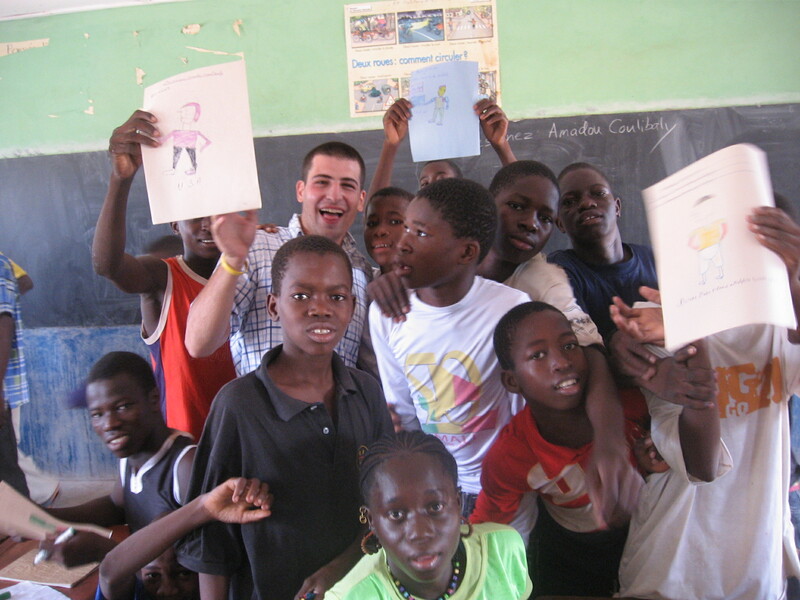 I am incredibly happy that I took this chance and decided to join the Peace Corps. I feel really fortunate that it worked out as well as it did. It was truly a once in a lifetime opportunity, and I would have never forgiven myself had I not had the courage, or really, the stupidity to do this. Now, I´m almost home and on to the next phase in my life. That last phase will be pretty near impossible to top. Sometimes though, life seems to have a way of surprising you. About a year ago I found myself in a little bit of a slump. I was a few months back from a visit to the states, and a couple months away from a trip to Ghana. In an attempt to raise my spirits I started making a list of the things I will miss most about Mali. I know it sounds a little bit corny, but I was hoping that in making this list I’d be thinking about all the things I love about this wonderful place. As time went by I slowly added to my list. Anytime I noticed something that really made me happy. As I write this, I have about ten more days as a Peace Corps Volunteer. I cannot believe I am writing those words, and it really has not even begun to sink in. But, since my time is almost over I thought maybe I should share some of the things I am soon to miss. Right now, we are in the midst of rainy season, and Malian rainstorms are something I will never forget. I have felt the rain down in Africa and man does it pour. I realize that we have stars back home, but out in village where not a single light or speck of pollution can obscure your view, you finally realize that there really are a whole lot of stars. I’ve heard that we have a moon in the states too, but you really notice it a whole lot more when it’s your only source of light. You can always tell when the moon is full because the kids all go crazy at night, dancing and playing in the streets. I will miss the street food here so much. Here in Kayes we have a lady named Fanta Diallo. We love her. Beans and pasta for a buck. Why don’t we have beans on the street? Spending at least 90% of my time outside. This is of course by neccessity, but it’s still pretty cool. When I am inside it’s only to sleep, and under my mosquito which I realize I probably won’t need at home. I still might use it. I cannot describe the feeling of climbing into bed and just somehow feeling completely safe. I will miss my students so much. That’s near the top of the list. They are amazing. In terms of their levels of learning, they obviously don’t compare to American students. But in courage, they blow them out of the water. Whether they bike 10 miles every morning, live away from their families 9 months out of the year, or even come to school and feed their babies during breaks, their courage blows me away. I made sure to tell them as much. There’s a corny baseball movie I love called “Hardball” in which Keanu Reeves, a baseball coach, tells his team that, “I am blown away by your ability to show up.” That pretty much sums how I feel about those kids. In particular I love Fily Sidibe and Baila Sow’s cursive (so perfect). You have to admit Americans don’t place much value on handwriting. My own is illegible. I will miss Fousseyni Sissoko’s cocky walk. He had this walk that just announced how confident he was. I will also miss Sekoba Damba’s breathtaking running. This tiny 7th grader could run like the wind without even looking like she was trying. Soccer fever! I wish I could somehow bring that back. My soccer buddies. I loved being on that field. Playing as just one of the guys. Sports are really the great equalizer. I cannot remember ever being so nervous for any game as when I was playing goalie for Dialafara with the entire town out watching. I’ve also never had more fun watching sports than watching the World Cup in village. I’ve also never had more fun watching a game when my team lost then when the US lost to Ghana. I was dissappointed to say the least, but man it was fun. It wasn’t just the World Cup either. It was Champions League, African Nations Cup, and every little exhibition match. It was 40-plus people crowded around a ten inch (at most) TV. Buying phone credit is a random one. But, it’s kind of like playing the lottery and winning every single time. You buy phone credit on the street, and then scratch off these card. I always win! I will miss having so many people to speak French with on a daily basis. I’ll actually miss skyping with people back home too. And huge packages in the mail. I never thought I’d be so excited to get powdered drink packets. My breathtaking view of the mountains is something I will never forget. I remember in my first month, I thought that as long as I could take a glance at that view, that everything would be ok. Somehow that made sense to me. Sometimes when I get asked what I will miss the most, my answer is my cats. It’s actually only a half joking answer. Simba, Nala and all her millions of kittens. I wasn’t at all a cat person before coming here. I was definitely won over here. Their calming presence helped me so much. Also, Malians are deathly afraid of cats. I have no idea why. My friend Abdoulaye was freaking out about kittens. Kittens! They seem to be convinced that cats are the devil. I think they’re really cute. Malian children are another thing high on my list. First, they can all dance. From birth, it seems like. 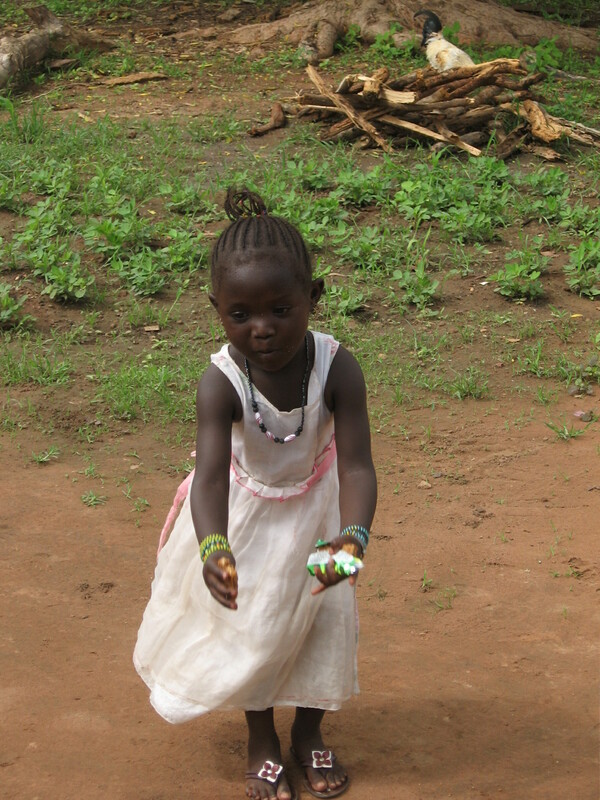 My homologue’s two year old daughter Coumba can already dance. Really, they can all dance amazingly. On the other hand, I look stupid. Generally kids about age two to eight or so only ever have two reactions upon seeing a toubab (white person). It’s either incredible excitement, or they’re deathly afraid. Either way, they’re running. Towards me or away from me. Some qualities are hard to pinpoint. But the eternal optimism in Mali is just incredible. For such a poor country, you would never guess it on the people’s faces. I think eating out of one communal bowl is something else I will miss that somewhat helps to underline these qualities. Even though they have so little, everything is still shared. Everyone takes their part, and even eating serves as something of a social practice. It is something of a bonding experience crowding around a bowl with as many as ten people. Another random thought. The money. Malian (West African) money is extremely colorful and closely resembles monopoly. Why is our money so boring? Then there is the smell. Africa just has a certain smell. I felt the same thing in Senegal. It could just be the garbage, but I’d like to think it’s just something special about Africa. Then there is the simply magical swish of a women’s pagne. A pagne is something like a skirt, but it’s more like a beautiful flowing fabric. They walk along making a “swoosh, swoosh,” type of sound. Malian women amaze me so much. The men are basically lazy bums. Every single day, I find myself staring at a Malian woman doing what to her is a daily, ordinary task. Whether it’s carrying 500 pounds on her head, or cooking for an army, it never ceases to amaze me. They do it all, and they do it all with incredible grace and beauty. These are really in no particular order. The only thing that I’m absolutely sure about is that number one is my fellow Peace Corps Volunteers. I know I will see a lot of them again in the US. It will never be quite the same though as when we met up in Bamako or Kayes or wherever, for a break from our villages. The bond between all of us is truly forever though, and years from now we will be able to look back on this experience we shared, and smile. Arts and crafts day pics.. Host family, hiking, biking pics.. I am silly. I am naive. I am stupid. How easily we forget. How could I possibly think that hot season would be my last challenge? In Mali, there are always more challenges. Just a couple of examples.. I decided to come out of my retirement from African running for one last half marathon. This was a huge mistake. I think it was some fish I ate, I’m not completely sure, but I got pretty sick the day before the race. I basically lived in the bathroom that day (let’s just leave it at that). But I am nothing if not stubborn. So the next day, heavily medicated, I ran the race anyway. I’m pretty sure it was the single worst race of my life. The first few miles felt ok. I ran side by side with my good friend Josh. But really, after that it was all downhill. I was just trying to hold it in on both ends. I ended up throwing up a couple of times on the side of the road. Again being stubborn, I wanted to finish the stupid race. It took over 3 hours to finish. I got a lot of help from other volunteers who had chosen to bike the course to direct us and give us water. It was absolutely miserable. I was pretty out of it the next day or two. This time I’m finally officially retired from African running. It really just isn’t my friend. My bus rides of late haven’t been so great. Not that they really ever are. I reached a new career best (or worst) 14 hours for the 100 miles back to site. The time at site actually went pretty well though. I had my last few classes ever at Dialafara’s Second Cycle School. Juliette had sent me a ton of art supplies for the school, so, for some reason (maybe again because I’m stupid), I decided to have another arts day (since it went so well last time). I was ready for the pure insanity this time around though. Since I knew it was going to be crazy, I just kind of went with it. I sent a student that I trust, Sibo, to go grab my camera. Of course, the camera only added to the insanity. I snapped a ton of really funny pictures, and ended up with a lot of really amusing drawings. It was the most disorganized class probably ever. But, it was also the most fun. I was laughing the entire time. They decided they wanted to draw Amadu. In the end a few markers went missing, which the principal wasn’t too happy with, but it really was an amazing memory I well never forget and a fitting end to my time at that school. With school over, I don’t have a ton left to do, so it was a fortunate coincidence that one of my good friends, Sara, asked me if I wanted to help her paint a map in her town of Segala. Mr. Geography never turns down a chance to make a map! It was really nice to get to see another volunteers site. As volunteers, while we are all going through the same things, each of our situations is unique, which makes it pretty cool to compare notes. Her village was overwhelmingly friendly, and I loved her host family. Only the langauge was different (Peul). As a result, most of the time, I had no idea what was going on. Or even less than usual. It made me wish that I had taken the opportunity to see more volunteers’ sites, because they are in fact all unique in some way. 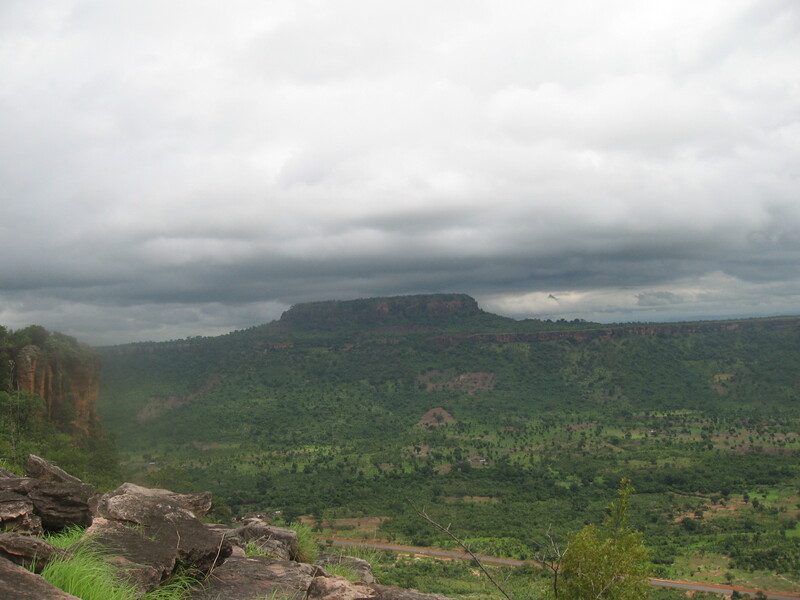 From Segala I headed to Bamako for our COS (Close of Service) conference. The conference itself was not terribly exciting. Seeing everyone again was. Our group gathered one last time from all across the country. The last night of the “conference” we had our version of a prom, with Born to be Wild as a very appropriate theme. I was dancing and jumping around, and hugging everyone. It was one of those nights you just wish you could go back to whenever you felt like it. Somehow, in thinking about everything I’m looking forward too, I failed to take into account, however, everyone I’ll be leaving behind. The goodbyes have already begun, and several of my closest friends have already gone home. So, to say the least, these last few weeks have been quite the roller coaster. Some incredibly “up” moments mixed in with some pretty tough “down” ones. One last example sums it all up as best I can. The other day, I woke up with a pretty ugly right side of my face. I had some sort of yellow puss oozing out of my cheek, and pretty bad swelling under my right eye. Naturally, I was kind of freaking out. I had no idea what it was, or why it was only on one side of my face. I definitely would have been happier if it had covered my entire face. That would have made more sense. Or something. I asked Mr. Dembele, the science teacher, and a man I have really come to trust a great deal, what he thought it was. He and my homologue were laughing a little at my expense. Mr. Dembele thought it was some sort of insect. In any case something had definitely bit me or stung me during the night. He told me it was ok, and it would heal on its own. He then made a comment to the effect of “Don’t worry it’s not like your going to die.” I must’ve really been freaking out. He then asked me if I had any toothpaste. I was sure I had misunderstood him. I thought well, I do need to brush my teeth, but I don’t see how that has anything to do with this mess on my face. I came out with my toothpaste and brush. He took the toothpaste out of my hand and spread some of it on my face. I was skeptical of this practice. An hour or two later, I got lucky, as a Peace Corps shuttle happened to be passing through and I caught a ride up to Kayes. On the way, I looked at myself in the mirror, smiled and laughed out loud. The driver Vieux, who is one of my favorite people in Peace Corps, asked me why I was laughing. It was just the whole situation. In Mali the wonders never cease. I had toothpaste on my face! I looked like some sort of alien. But, I could tell that somehow, there actually was less yellow stuff than before. As I write this, my face looks pretty much normal. So goes life in Mali, up and down. And hopefully back up. Goodbyes, crazy art days, terrible races with food poisoning. It’s all part of the adventure. That’s really it. Sometimes, your face blows up, but all you really need is some toothpaste to make it all better. May in Kayes region is hot (funtini be = it’s hot). It still hasn’t rained in my village since the middle of November. I basically sweat all day. The other day I attempted to run in the morning before school. The run went pretty well, but I never cooled down. I was sitting in on a French class, and just sitting in the back sweating profusely. If anyone remembers Patrick Ewing, he would have a personal mop-man follow him around when he played for the Knicks, that’s what it was like. I was miserable the past couple of weeks at site. So, I was sitting there with my own words echoing in my head. The whole optimistic thing where I decided that weather doesn’t determine your mood. That’s when I decided I still think I was right. The weather was really just making a bad situation worse, not the initial cause. When volunteers have only a few months left, they start asking each other if they’re “checked out.” Mentally, it is tempting to look forward to that next stage of your life. I have absolutely loved my time in Mali. But, I am no exception, I really am ready to continue with the next step. So, the countdown has begun, and mentally I’m not as into it as I once was. It’s really hard to believe that I’ve been here in Mali almost two years. It is an incredibly surreal feeling to realize that this much time has passed. As my time winds down I’m becoming more and more nostalgic for the places and people I haven’t even left yet. I can’t help but wonder where all the time has gone. I remember my first few weeks in Mali, and then my first few terrifying days alone in Dialafara. Back then time seemed to crawl, and I just wondered if I could really make it. Somehow though, time magically sped up. Time flies when you’re having fun? So, you’ll have to excuse me as I look ahead. I’ve adjusted to everything and ended up really enjoying myself, but now, I’m ready to go. 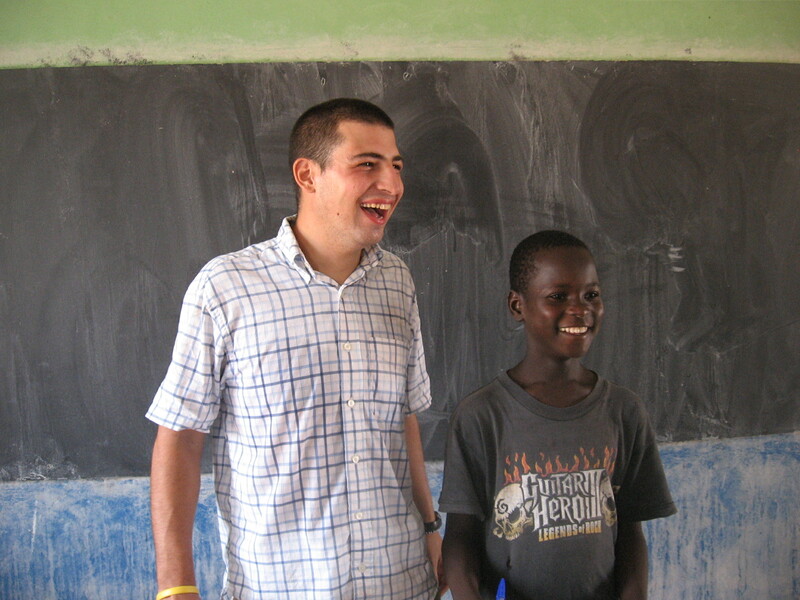 Another day sitting around in my concession, Mr. Keita, the French teacher, and one of my best friends at site, seemed incredibly concerned about me. He looked over at me and gave me one of the saddest “Ça va?” ‘s I have ever heard. It implied more than how are you. It was as though he saw me suffering and genuinely thought I might just faint or pass out at any moment. I had to smile. It is rough, but it is my second hot season. So, although it is miserable, at least this time I am used to the misery. For some reason, I have chosen this time to let my hair grow out. In some way I feel like I am defying the heat. Or at least attempting to. I’m trying to at least continue to be somewhat useful at site as my time winds down, and the school year also comes to a close. This is also my best attempt at a lesson on aid. So, the school I work at used to have a wooden (large sticks) border around the outside to prevent animals from coming into the school’s courtyard. But after last years rainy season, and some stronger recent winds, the border began to fall apart. As a result dogs, goats, donkeys, etc. began to just wander in to the school’s courtyard area. My homologue, who in all honesty never really asks me for much, wanted to know if we could do a project to build a cement wall around the school. I thought it wasn’t a bad idea, and the fact that he never asks for much certainly helped his case. Me, him and Mr. Keita began the process of figuring out what we would need tp make this project and how much it would cost to make it happen. When we did the basic calculations we figured out that it would cost a between three and four million CFA (about $8,000). That’s a pretty large project. Although we might’ve been able to get the funds, since the town would’ve been able to give us the sand, I was now pretty hesitant to do a project that big for something as unimportant as a wall. Then, I had a very interesting conversation with another teacher and friend, Mr. Diabatè. He told me that if we just gave them money, that no one would learn anything except to sit around and wait for money. What we ended up deciding was that all of the students each brought a couple of large logs, and some bamboo to tie them together. The kids worked hard for a couple of afternoons, and the end result was a pretty well constructed border. I couldn’t help think that it seemed much more appropriate to Mali than a cement wall would have been. All I had to do was supervise and make sure everyone brought their wood to school. Mr. Diabatè had a point. By doing it this way, the kids and teachers see that hard work just makes more sense than waiting for someone to come throw some money at them. This highlights one of the biggest problems with foreign aid. You can’t just throw money around or the people will become dependant on that money. Some people with money do want to help though which is admirable. A fellow volunteer told me a story from his site. A French NGO give his village a bunch of money and built a playground. That sounds nice, until you actually consider just how far down the list of priorities a playground really is. This is a town without running water, or even a pump. They have one school that has grades one-three. On other words they have far bigger problems than trying to figure out where their kids will swing. But, this NGO doesn’t know that. They have money, and they want to help. They have no idea what the village really needs. Peace Corps is not perfect by any means, and I am far from the best volunteer, but I really believe that PC gets a lot of things right. The fact that we are placed in villages, and for two years really makes a difference. We learn their language, live like them, and do our best to integrate into our community. This closeness, allows us to get to know our individual villages. Eventually, from talking to people, we begin to understand what it is that our village truly needs. So, not that Peace Corps is the only way to do it, but spending the time is almost more important than spending the money. At least in that regard, Peace Corps gets it right. Finding out what the village really needs first and foremost is the first and most important step. Yes, we want your money, but please don’t throw it away. Even though right now I would pay to be able to swing and slide. Other than my Dr. Phil rants things went really at site this past month. I’ve begun sleeping outside because of the heat. I love it. I’m even used to all the animal noises that used to scare me. My school took an almost two week vacation after the second semester for what they seemed to think was Easter. So, my closest site mate, Katharine, who is also an education volunteer decided she was bored. We had talked about doing World Maps at some point and this seemed like the perfect time for it. She, first, made the trip up to Dialafara. We painted our first map on one of the walls in my new library. 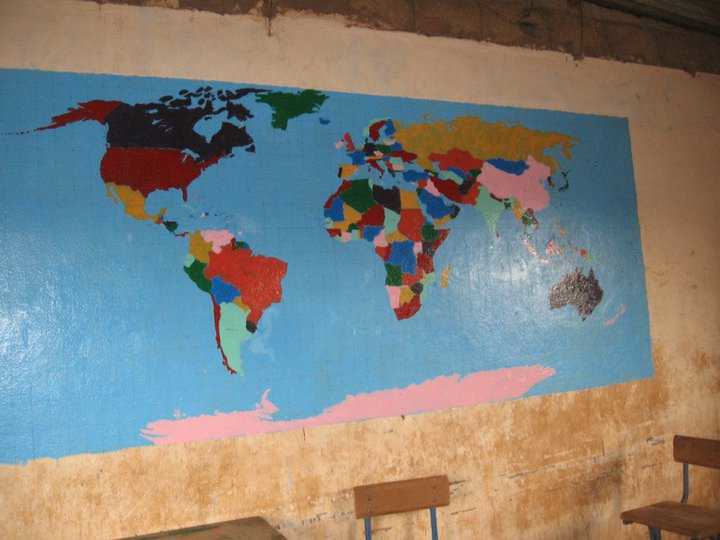 Now, painting a map may seem like an easy enough activity. I can assure you it is just a little more complicated than it should be. First, we painted a huge blue rectangle, which I must admit, actually is that easy. Next though came the difficult and tedious part. Our map was pretty large (about 10 ft wide), and our next step was to create a grid of boxes 5 cm large (or small). We probably rushed through it a little bit in order to just be done with it. As a result, our grid was a little bit off. As we then traced the outlines of the countries, we realized that because our grid was off, in turn a few of our countries were a bit off. India, China, and Thailand ended up being a little bit larger than they should have been. We finally painted all the countries (the fun part), and it actually turned out pretty well. It wasn’t perfect and we discussed how to make the next one go even better. For most of these kids, they really have no concept of anything outside of Dialafara. They’ve never even heard of Thailand! So, hopefully, this helps at least a little bit with that lack of knowledge. It was really nice to have a visitor at my site and someone to talk to in English. Although the fact that she was a female visitor certainly did raise a million questions. I cannot count the number of times I have been offered wives, so maybe at least that will stop now that people think I already have a wife. We finished the first map in a few days and headed back down to Katharine’s site (Kenieba). 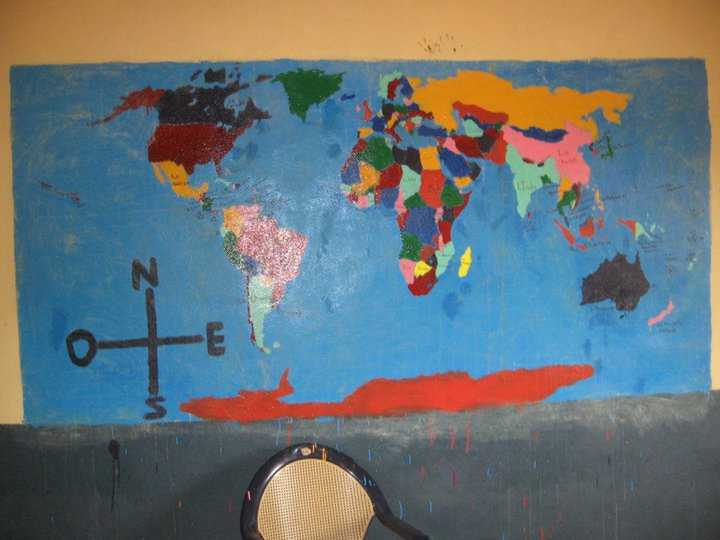 We did our second map in the 6th grade’s classroom at the school where she works. For some reason her homologue and the school principal seemed to have nothing better to do. So, in spite of our best efforts to subtly hint that they really didn’t need to stay around, we had an audience for the whole time. Luckily, this didn’t stop us from rocking out as we worked. I can’t imagine how boring it must’ve been to watch us draw tiny rectangles. We really took our time, and we spent a day and a half on the grid alone. The principal seemed to be getting a little bit antsy wondering when we were going to finish, or at least start to actually paint. But, we stayed patient, despite his best wishes, and we ended up with an absolutely perfect grid, and as a result, a perfect map. I was incredibly proud of the way this map turned out. It really looks amazing. We also ate really well in Kenieba. Katharine’s host family spoiled us, and the street food in Kenieba is amazing. I love my beans! One night after a great meal I sat there and wondered what could possibly make this moment any better. That’s when I heard Katherine’s host sister’s phone playing Justin Bieber! Yes! 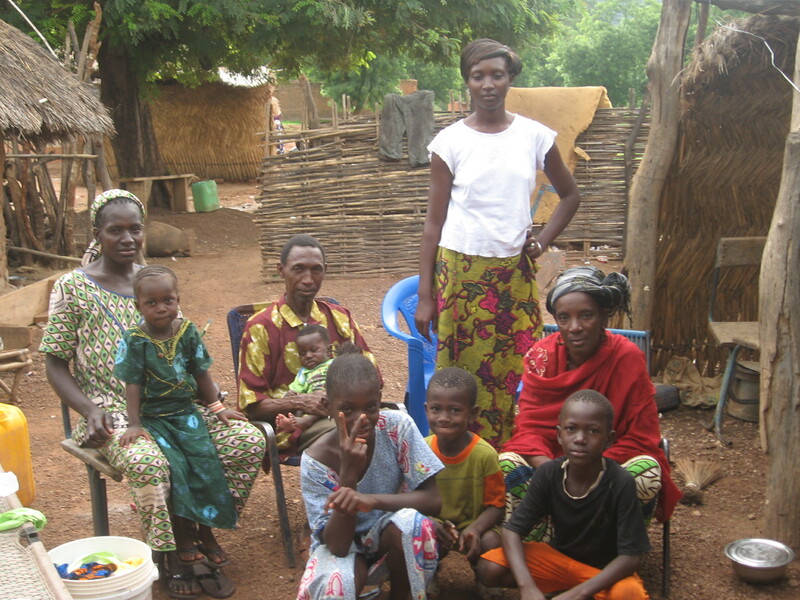 Bieber fever has finally reached Mali. You simply cannot stop the power of the Biebs. I was incredibly happy. In that moment I thought about Senegal. 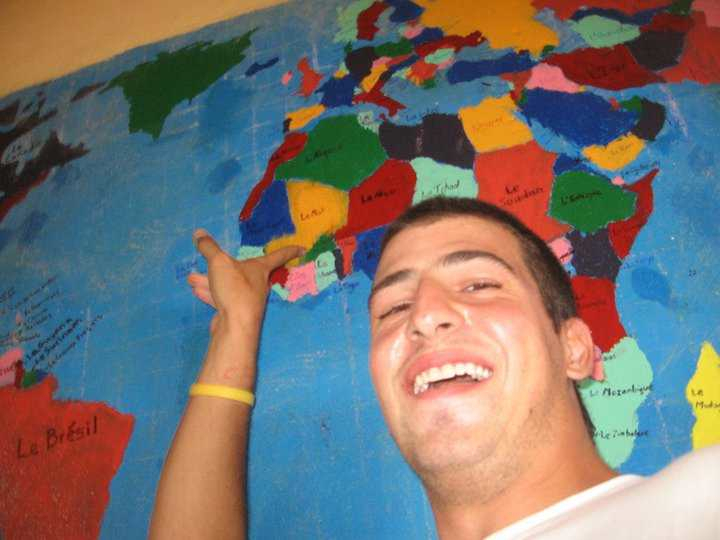 During the Spring of 2007 I studied abroad in Dakar for the semester. I had an absolutely amazing host family. I got along really well with everyone in my group. I had TVs, amazing food, and a somewhat modern city. Still, I couldn’t wait to go home and away from Africa. Not until it was much too late, maybe a few weeks left, did I finally begin to really enjoy myself. Now, I wonder, have a really changed that much in a few years? Am I older? More mature? I really don’t know. Since I’ve been living here in Mali, I’ve been back to Senegal several times. Dakar has become quite possibly my all-time favorite city. It is as close I’ve seen to a perfectly happy medium. It is still friendly enough to have the hospitality that is distinct to the area, and yet it has a decent amount of amenities that you would normally associate with the Western World. I’ve also seen my host family several times since I’ve been back in the region. I’ve tried as best I can to let them know how much I appreciate all they did for me. They are greatly responsible for this path that my life has taken. Maybe, I have changed. I can definitely appreciate the values that Senegalese and Malians seem to pride themselves on, and will try to apply those same values as I move forward in my life. I don’t know if I am any more wiser, or more mature. I do know that I took a lot of extra pleasure in painting Senegal and Mali onto our map. I was skyping with a friend today, and we realized that it was the same temperature in the US was here. Only his was Fahrenheit and mine was Celsius. Yeah hot season is coming on strong. It’s 45 degrees. That’s about 112 or so for all you Fahrenheit folk. Somehow though, it’s not bothering me as much this year. I think there are a couple reasons for this. First, I’m used to it a little more than last time around. Second, I’m much happier. I have this theory, so bear with me as go Dr Phil on you guys. I think that contrary to what most people think, I really don’t think that the weather determines your mood. Let me explain. I do think that the weather can affect your mood. For example if you’re in a bad mood, bad weather can make it worse. Likewise, a good mood can be made even better by a good mood. I just don’t think weather is enough to reverse your mood by itself. I think if you’re truly unhappy, that’s really the sign of something else deeper that’s probably wrong in your life. Weather is just an easy scapegoat for a greater issue. So, I really think, the fact that I am truly happy with my life, completely comfortable in Mali and in my surrounding means that the weather isn’t enough to put a damper on all of that…if that makes any sense. While, I was back in the states in December, another friend of made a statement that has stuck with me and now come to take on a different meaning. He said to me that he thinks about me sometimes while he’s sitting in his office and thinks about how different my reality is from his reality on a daily basis. But as I’ve returned to Mali, and as my service begins to wind down, I keep thinking about what my daily reality really means. The other day I was completely out of water, and needed to go to the pump to get some. I took my two 10L jugs the short walk to the pump. I began to pump, and a couple of students insisted on doing it for me. Probably because they know I really have no idea what I’m doing. Generally I never get to pump my own water without several kids stopping me to do it for me. Most of the time they then stick my jug on the back of their bike too. Otherwise I struggle to lug the water back to my house, and struggle to make it not actually look like a struggle. But as I watched these young kids pump the water, my buddy’s words came back to me. The truth is that I am actually in some small third category. Somewhere in between the office job and the Malian child is where I actually belong. Their reality is still so much different from mine, as much as I would like to pretend it’s not. They’ve been pumping water their whole lives. They’ve never known anything differently. The truth is, I’ve always known that at the end of my two years, I will go back to that first reality. There is no question that I will never be the same person again. But still, I will go back to that crazy place where water just comes out of a faucet, and clothes get clean from a magic machine. It is still hard for me to imagine, exactly what it would be like if this is your only reality. If Mali is all you’ve ever known. I’ve also been aided even further by the knowledge that if I really couldn’t handle this small piece of their reality, that I could quit and go home at anytime. Although I’ve had some times when I’ve felt down, I’ve never all that seriously considered leaving. Still, the fact that I could leave at any point is somehow comforting. Malians don’t exactly have anything to go back to. They have to make the best of what they have. As a result they jump up and down as they pump. In the end, it looks almost like some sort of game or dance. They appear to somehow be enjoying themselves as the water seems to come pouring almost effortlessly out of the pump. I simply watch them and smile, as they do what they’ve always done. They really just make the best out of what they have. Malians really have this incredible love of life (joie de vivre). I’m going to miss this place so much. For now, I’m enjoying myself even as I sweat even as I sit and do nothing. Soon enough, my reality will include AC and heat whenever I need it! Even since I wrote that entry not even a month ago, I have had many more crazy adventures in Malian transport. One volunteer had a bag stolen/lost off the top of a bus. The sketchy bus company attempted to somehow put the blame on us. At this point several other volunteers jumped to her aid and started screaming at the employees. It feels good for all of us to get that out of our systems every once in awhile. Unfortunately it didn’t accomplish anything. I had another bus ride that took over 8 hours to travel 50 miles (80 km) to my closest site mates in Kenieba. It was worth it though. I always turn into Chatty Kathy when I get to see my friends after a long stint at site. I’m sure they’d like me to take a breath or two. Other than the terrible bus adventures, my last month at site was going pretty well, at least until I started getting sick. It was really hard being sick in village. What made it harder was that I really didn’t know what I had. Malians kept insisting I had night fever, whatever the heck that is. I thought that was a John Travolta movie, personally. Whatever it was, I knew I was sick. I would sit around for tea, and fall asleep, instead of contributing anything to the conversation. I was kind of hoping my cats and goats would comfort be, but this was not the case. Maybe because I wasn’t around for my kittens’ first couple weeks, but they are the meanest kittens I have seen. Every time I try to pet him, he hisses, thinking he’s super ferocious. It’s almost cute until he starts to scratch me. I wanted to give my friend Billy a kitten but I didn’t think he’d be too happy with this one. I even feed him all the time and he still won’t let me pet him. At least Nala is still nice to me. I’ve never been a cat person before. But here, I find that Nala is good company. On the other hand my goats are not so great. My homologue got a mother and a baby as a bonus. The mom seems like she’s getting old. The young one used to be super cute. Now though as he grows up, he’s just getting more and more aggressive. For someone who has never so much as spent a day on a farm, it’s a little scary. I have no idea what to do with a charging goat. I hold onto his horns and just hope he forgets why he’s angry or something. So, our cute little guy has grown up and become a fierce animal with big horns. We’ve started tieing him up most of the time as a result. One day, a little boy from my host family came to give me some breakfast before I went off to school. That was very nice of Sakoumba. Unfortunately he also left the fence/door to my compound slightly open. So, as I got ready to go to school, the young goat seized the opportunity and ran out of the compound. I soon realized what happened, and chased after my goat. He was just looking for some loving, clearly. He ran and jumped on any females he could find. Meanwhile I went through my village sprinting after him. People were laughing hysterically. I’m sure it’s not every day they see a toubab running after a goat. I was cracking up. How could I not laugh at the situation? It was an absolutely ridiculous scene. Me chasing a goat, the goat trying to jump on females, and escaping my grasp. Finally a group of young kids saw how much trouble I was having catching my goat, and we finally surrounded him. I grabbed him by the horns and dragged him back to my compound. I closed the gate and headed to school. I showed up sweating profusely and a little late. I greeted my homologue (the principal), told him what happened. I’m sure I looked ridiculous. We shared a laugh. Late for class because I was failing at getting my goat under control. How great is that? Now, I know I have to keep a close eye on my goat. As I write this, I’m feeling much better. I’m back to my old self. I’ve been completely cleared to go back to site. All my tests came back negative. I actually have some energy these days. I was actually somewhat useful playing basketball the other day. Unfortunately it’s also getting much, much hotter. Hot season is here! At least it’s starting. It’s about 110 right now, headed up to 120 or so. March to May or so is hot season in Mali, until the rains start to come in June. To me it’s almost as though hot season is my last true test of my service. I’m hoping that since this is the second time I’ve been through this, maybe I’ll be a little bit better prepared mentally. I’m definitely looking forward to sleeping under the stars. So, I’m back to site today, at least that’s the plan. You never can tell with Malian transport.